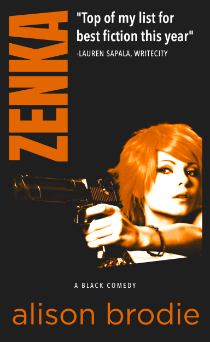 In Zenka by Alison Brodie, Zenka is a Hungarian pole dancer that mob boss Jack Murray saved from certain death. When he discovers that he has a son and finds that he’s not everything he could have hoped for, Jack asks Zenka to transform his warm-hearted and weak-spirited son. Will Jack and his son, Nicholas, turn out to be cut from the same cloth? The author, Alison Brodie, sent me a copy of this novel in exchange for my review. I had to go back and read my review of Brodie’s first novel Brake Failure as what I remembered of the novel told me that Zenka could not have possibly been written by the same author. Both books are outstandingly good, but their voices are in different styles. Where Brake Failure had a southern fiction, Fannie Flagg, kind of voice, Zenka is straight out of Guy Ritchie’s world. There is dark humor in both, but I think Zenka may be the stronger work just from the number of storylines that are pulled along and the separate spirit of the narrative. It wasn’t at all easy to predict where the story and characters would end up. The eponymous Zenka is not the leading voice of the piece. She is a native Hungarian whose voice is written in cultural patois. Jack’s is a Cockney voice and there is a listing of London East End slang at the start of the work. Most were familiar to this native Michigander having watched an episode or two of Eastenders in my time, but some were new. Zenka and Jack meet when he rescues her and other women who have been sold to a Romanian gang, but a sure to be a poorly fated woman named Olga. Zenka opens the novel by telling us in a letter to her friend, Alina, about her fight for survival and eventual rescue. The relationship between Zenka and Jack is perfectly framed in that opening letter. She will do anything for him and he would do anything for her to leave him alone. When we learn about Jack, we find him irredeemably violent but his heart shines in both his dealings with Zenka and his desire, once he knows about Nicholas, to be something of which his son can be proud. The trick is that a man with enemies can’t take the chance of them knowing that he has anyone to love. Zenka becomes conspirator and liaison on getting to know all about the son he fathered at 16. A primary voice in Zenka is Trevor, Jack’s accountant and a man that he’s come to regard as family, true family as they both love and resent each other. There’s a bit of a Crowley-and-Dean dynamic if you’re a person that follows Supernatural — good-natured reliance with a bit of a healthy “get the f*ck out of my face.” I adored the way Brodie wrote the dynamic between the characters most closely connected. They are neither all good or all bad and the way they build over the course of the 324-page novel is impressive. Brodie’s flow is economical but complete. Her poetry in motion way of painting the Zenka character and the daily life of those she comes across is practiced but not pedantic. Her story is at turns violent and funny but has a warmth that brings a common thread between Zenka and her previous work. Brodie cheers for her characters in a way that is clear to the reader and magic in the story. To say that I adored Zenka is selling it short. It was a great novel and is the sort that a reader needs from time to time to both clear the palate and bring the love of reading back to those of us worn down by the business of life. Seriously, pick Zenka up today. You will thank me. Also, check out our review of Brake Failure by Alison Brodie. Thanks, Alison. It was alt of fun.